Skerries travelled to Limerick on Saturday for a crucial encounter v Thomond which over the years has been a difficult venue for the team. Losing Joe Glennon and Thomas O’Hare before the match did not help the situation. 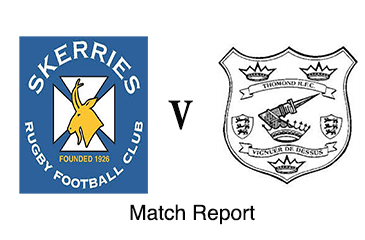 The match was played in blustery conditions and Skerries played into the elements in the first half and did well against a big pack of forwards and the excellent place kicking of Dermot Fitzgerald who kicked 4 penalties, the two before half time proved vital. Half Time score Thomond 12 Skerries 0. Early in the second half Paul O’Loghlen kicked a penalty to reduce the deficit but for the next 20 mins Skerries struggled to penetrate a well organised home defence who were holding out for a first win of the season. In the 70th minute Paul O’Loghlen kicked another penalty to make the score 12.6 and the kick gave Skerries a bonus point which may be important come the end of the season. It was a bruising encounter for the Skerries team and one that will stand to us as the season progresses. Next up a big home match v Greystones on Friday Night at 8pm. A big crowd is expected and the team need huge support against one of the promotion favourites. Skerries Team , 15. Maurice McAuley 14. Lorcan Jones 13. Michael Turvey 12. Colin Doyle 11.Paul Devitt 10 Paul O’Loghlen 9.Eoghan Carron 8.Ross McAuley © 7.Kieran Leonard 6.Evan Sherlock 5. Tom Mulvaney 4. AJ Sherlock 3. Cormac Marrey 2. Chris Tonge 1. Mark Nally Subs. Conn Marrey, Neil Martin, Dean Harford, Mark Oliver, Ruari Woods.